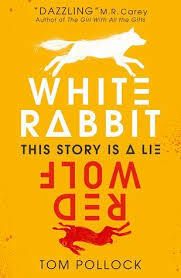 Touted as the new Curious Incident this is a very different book, and I think if you go into it expecting a lovable main character trying to make sense of the world around him you may be disappointed. Peter is a mathematical genius. He uses maths to manage his extreme anxiety, and is convinced that maths has the answer to everything. Being that bit older than Haddon’s protagonist, he’s also got a slightly different take on the world. From the moment we first meet Pete crouched in his kitchen having eaten a salt cellar in an attempt to stem his overwhelming anxiety, it’s clear that this is going to be an unsettling read. I truly wasn’t expecting it to be as dark as it was. It was fascinating to get under the skin of Pete, but the actual story was more focused on the thriller element and it had to be this way in order for the plot to work. When Pete’s mother is stabbed as she goes to receive an award for her work, his sister is missing and he quickly learns that no one around him was who they claimed to be. We’re plunged into a nightmare world of spies, scientific manipulation and some gruesome deaths. I don’t want to reveal too much more. Suffice to say, nothing was quite as it seemed and every time I thought we were getting somewhere there was another detail given that turned things on their head. This would have been an all-out recommendation, but for the sense of everything feeling rather rushed by the end and being left rather uncertain about a few key details. Still one I’d heartily recommend. Thank you NetGalley for letting me read my oddest of 2018 so far. There were issues with my ARC – parts of text missing or disordered – and this meant there was some inevitable confusion as I tried to keep fixed who was the focus/what was happening. Those issues fixed, I think this will be the kind of read you’ll either fall hook, line and sinker for or you’ll be ambivalent about. I, sadly, was somewhere in between. For me, the start of the story was not quite there. 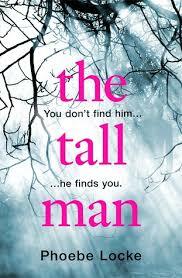 We’re expected to fall for The Tall Man story but without really being given enough detail to justify such a reaction. Throughout, the supposedly creepy references to this mythical figure felt forced. I never felt I had enough to substantiate this, feeling it was always something of a smokescreen for another story. Some reviewers have commented on the fragmented nature of the setting. This is disconcerting on occasion, but it does make sense as we learn more about Sophie, Miles and their daughter, Amber, as she is being followed by a film crew for a documentary about a murder. Certain details hint at there being more to certain characters and the events unfolding, but it’s not until later that we get to piece everything together. A story with humour, for fans of Skullduggery Pleasant. This is the first in a new series that promises to be great fun and, I hope, a great hit with readers. Jake find himself on the wrong end of a meeting with a spirit. He takes possession of a box – and, without thinking, opens it. Inside is a severed finger. For Jake it’s also the start of a rather surreal adventure. Jake finds himself hunted by employees of the Embassy of the Dead, and in his quest to avoid being sent to the Eternal Void he ends up befriending a Possessor, communing with the dead and doing all he can to keep his life. Slightly tongue-in-cheek and this looks like the first in an interesting series. 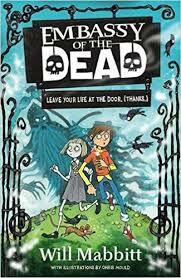 Thanks, NetGalley, for putting me on to something new for younger readers. First of all, I loved Caraval and thought it would be hard to top. Second, I have fallen in love a little (okay, a lot) with this world and can’t wait to see where Garber takes it. 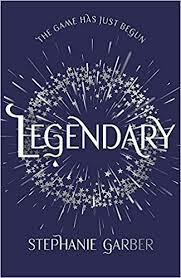 Legendary was – dare I say it – better than Caraval, but for different reasons. Once again, we’re plunged into a world full of mystery and intrigue. This time round we had some familiar faces, but it remains a world where we’re never quite sure what is real and what is game. Tella is determined to play Caraval this time. She has a friend helping her, and is determined that the price she will be asked to pay for this help will be worth it. What she has to work out during the game is just who/what is precious to her, and whether or not she is prepared to pay the price asked of her. There’s lots of twists and turns. There’s hints of awful things to come. But there’s also hope. Much as I wanted a neat tidy ending, it actually sets things up to be a very interesting finale. A seemingly innocuous action, done with little thought of the potential consequences, and I’m fairly certain that many teenagers could identify – to some degree – with this scenario. What will be quite different is that for most of us who carry out a ‘dumb/risky’ action there will be no further impact. Richard was not quite so lucky. From the outset we are told exactly what happened to the two students involved – Richard and Sasha. Sasha fell asleep on a bus travelling home from school, Richard put a lighter to their skirt and then watched as they were seriously burned. The consequences for both could have been so much more severe, but what we are privy to here is enough. We begin by focusing on Sasha. Born as Luke this section outlines how they came to view themselves as agender and what that meant for them and their family. There’s a lot of info packed into this section, but it gives a clear insight into some of the issues facing teens exploring their identity. Next we’re introduced to Richard, a cheeky young boy who wants to achieve. Circumstances seem to play a huge part in his life and the options open to him, but each person has to take responsibility for their actions and live with the consequences of their actions. As we watch the bus journey unfold, the moment Richard sets Sasha’s skirt on fire is fleeting. However, the repercussions of this moment are enormous. The story takes us through court appearances, how both families reacted and some of the wider issues involved. 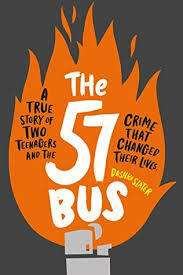 It poses a number of questions about hate crime, how teens are treated in the justice system and how we can accommodate difference. I felt quite humbled reading this, and very fortunate to not be faced with so many of the issues touched on within the pages. While the writing style had an inevitable journalistic tone, the story was engaging and one that needs to be shared. Thank you to NetGalley for granting me access to this book.